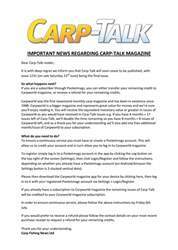 This week’s bumper issue of Carp-Talk (issue 1073) is available to download now. 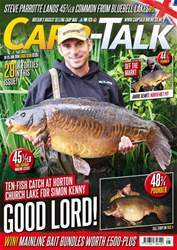 Look out for four different UK fifties in this issue, new Stanwick Roman Lake and Manor Farm Lake records, and other lumps from all over the nation. We recap the fourth round of BCAC heats, Mark Pitchers takes a look at surface fishing, Steve Cliff details his go-anywhere rig, and Iain Macmillan gets back to reality. 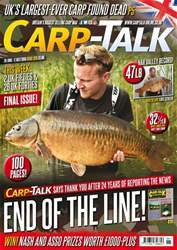 Simon Crow relives his capture of Eric’s Common from Rainbow Lake, Paul Monkman interviews carping legend Alan Taylor, and Jake Wildbore gets a surprise at Stanwick Lakes. 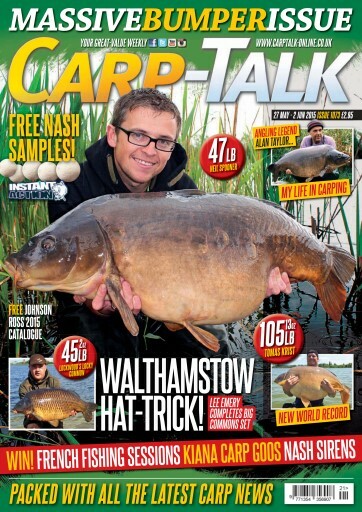 Ben Wales is drawn to the Quarry, Adam Clewer benefits from being versatile, Ash Bradbury looks back at 10 years of bait making, Steve Briggs returns to Echo Pool, Neil Richards tackles Manor Farm Lake, and products from Shimano Blakes Baits, Nash, ESP and Rod Hutchinson go under the spotlight. We’ve also got £430-plus Kiana Carp Goo, £690 Etangs de Chantereine and £530-plus Nash Siren S5 giveaways, and Wychwood Rising Stars.